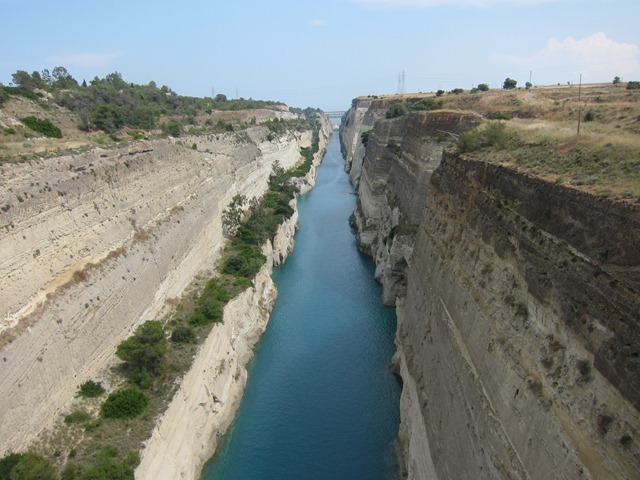 In early June I had the chance to visit the Corinth Canal with Sophia Loverdou, the woman who has launched a campaign to save the ancient diolkos (more on that campaign later in the week). As I wrote in this post in late June, she and I toured the part of the diolkos inside Military Engineers Camp. We also drove along the dirt road on the Peloponnesian side of the canal (visible just above the cliff face in the image below) and viewed the canal from various perspectives. She showed me the old bridge posts marking the location of the so-called “Nero Relief,” an ancient carving presumably left behind by the builders of the ancient canal before they abandoned their enterprise in the late 60s AD. 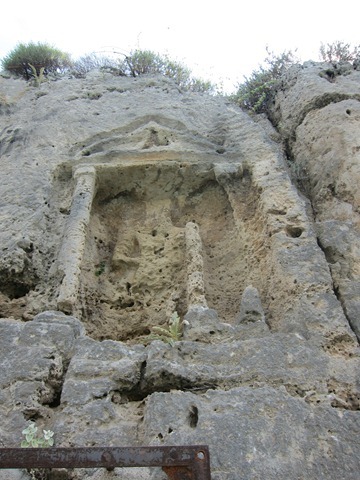 Nikolaos Verdelis thought this relief had been left by the Emperor Nero, and James Wiseman suggested that the severely eroding man could represent Heracles holding a club. It was great to know the location of the relief because I had only ever seen and photographed it from the canal itself on one of those “tour-the-canal” boat rides. 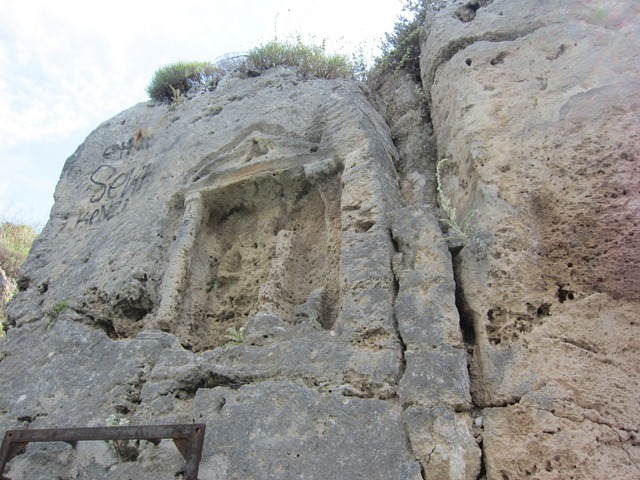 After Sophia left for Athens, I returned to the site, climbed down the embankment, and took some pictures. A comparison of these to Wiseman’s Land of the Ancient Corinthians, fig. 46, suggests that the stone has deteriorated significantly since he shot his photo in the 1960s. And of course, the sprayed black tagging shown on the rock face below is new. While I was driving along the dirt road, stopping and taking photographs, I caught site of one of those mega cruise ships, the kind you see in the postcards filling up the canal completely and being tugged between seas by a little tug boat called the Titon. Postcards often show a doctored photo of blue water and skies. What I saw was a cruise ship called the “Coral” having the roughest time in the journey, billowing out ugly dark smoke as it trudged along. I drove my rental car from the center of the Isthmus to the Nero relief and waited. 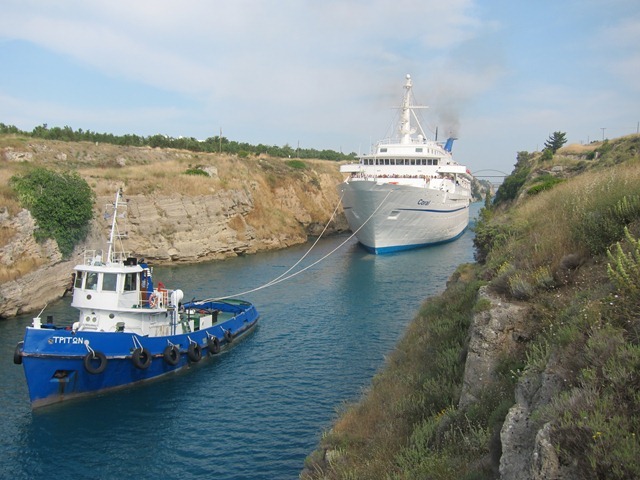 And waited…It took 45 minutes for the little Triton tug boat to reach the relief. I considered just going home, but my curiosity got the best of me. I shot several videos. The one below captures the moment of passing. The whole thing drew my own attention to connections between the past and present. Here I was witnessing the modern realization of Nero’s crazy idea to canalize the Isthmus to bring ships through it. But in this case, the purpose of the journey of the mega-ton Coral was not so much to pass through but to see one of the great engineering feats of the 19th century. 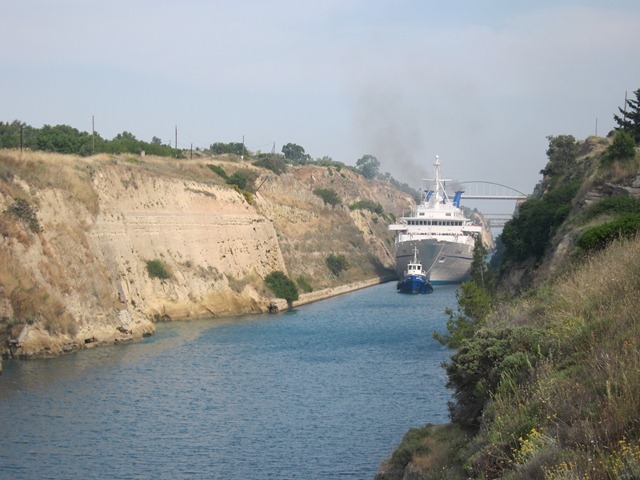 Imagine if Nero had accomplished the endeavor of making a canal of the Isthmus in the days before dynamite and heavy equipment: it would certainly have been one of the greatest tourist sites of the Roman Mediterranean.